Beautiful. Fast. Easy. Dulles Glass. 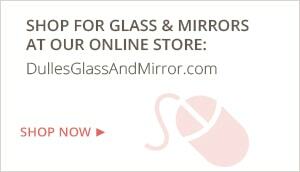 Dulles Glass will help you customize a beautiful bathroom or vanity mirror today! You can get the perfect bathroom vanity mirror, cut exactly to your size specifications and with the finishes you choose. Don't settle for a stock mirror that doesn't quite fit your space. Have one expertly installed by Dulles Glass today. Choose a large, custom-cut mirror for a smaller bathroom – it will really open up your space! Install a wall-to-wall mirror above your vanity for a sleek and modern look. Customize your mirror with options not available on stock mirrors – like beveled edges, decorative hardware, and glass types. Choose two custom-sized oval mirrors for a dual-sink vanity, and add your own decorative frame. You don't have to be a glass expert to create a great bathroom. Just submit a quote with the information you do know about your mirror project, and someone will contact you with a preliminary quote for free, in 24 hours. We'll help you get it just right for your business and your customers. Size: Up to a maximum of 48" x 72"
Not to be combined with any other offers. Washington, DC metropolitan area only.